On Sunday morning, Former Utah Governor Jon Huntsman continued his quest to become the Republican Party’s presidential nominee on Opposite Day, swinging hard at frontrunner Rick Perry (R-TX) and the rest of the GOP field. 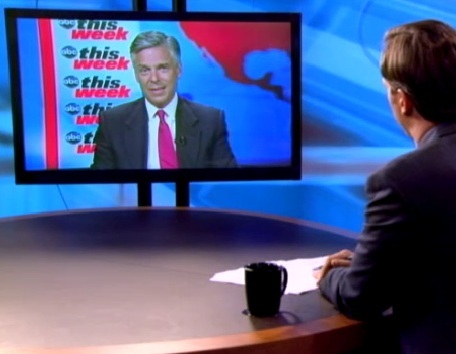 In an interview with This Week fill-in Jake Tapper, Huntsman derided his fellow candidates’ lack of leadership, opposition to science, and even cracked wise about Perry’s history of secession talk. “I can’t remember a time in our history where we actually were willing to shun science and become a – a party that – that was antithetical to science,” Huntsman said. With poll numbers that have him neck-and-neck with Margin O. Error, Huntsman is playing his hand the only way he can. Eleventh Commandment be damned, Huntsman is staking out the “aggressively sane” niche. While that doesn’t seem like a strong hand right now, a lot can change in the next few months.